Khenpo Samdup Rinpoche has requested that only those who have received the Phowa transmission from a teacher attend this special practice. However, the book discussion is open to all who wish to attend. 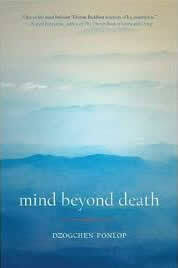 Mind Beyond Death will be available in our bookstore. Options for those who have not yet received the Phowa transmission. Contact us at info@gardrolma.org to meet with Khenpo Samdup Rinpoche to receive the instructions when possible or sign up for the next Phowa retreat held at Gar Drolma. You will be notified when it occurs. Attend our monthly Amitabha practice ‌the first S‌un‌day ‌of every month from no‌on—1:‌00 p.m‌. Submit names to be added to our book of those remembered at our monthly Amitabha & Phowa practices. Merit of these practices will be dedicated in their honor.